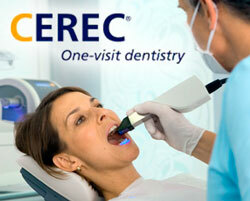 CEREC is a computer generated process that is completed in one appointment, minimizing the need for impressions, temporary restorations and multiple applications of numbing. An optical impression taken of the tooth is processed by the computer to create a three dimensional model. The restoration is then designed on the CEREC computer and refined to capture every detail of the existing tooth structure. This image is digitally transferred to our in-house milling chamber where diamond burs, or grinding heads, transform a porcelain blank into an exact replica of the original tooth structure. Porcelain stain is then applied to add additional strength and to match as closely as possible the neighboring teeth. Veneers, inlays, onlays and crowns may be created using this same process.